Archery Range: Monday - Saturday 10:00 AM - 7:00 PM Sunday 10:00 AM - 6:00 PM Gun Range: Monday - Saturday 11:00 AM - 7:00 PM Sunday 11:00 AM - 6:00 PM Please call for more information. Additional photo packages are available for sale and are printed in-house while you wait. 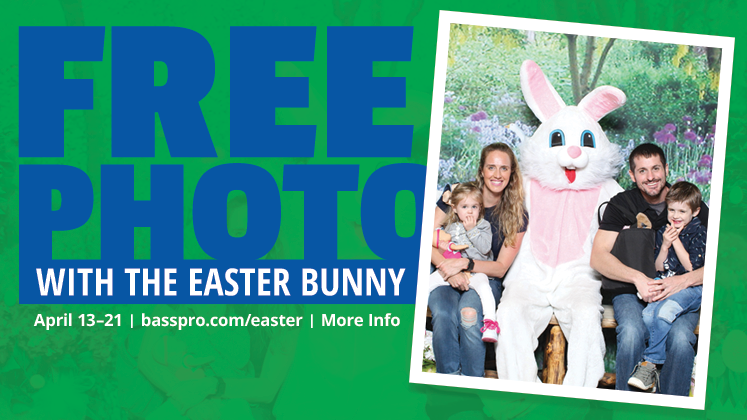 10X extra CLUB points on the purchase of all Easter photo packages. FREE Giveaway to the first 75 kids each day, Monday through Thursday only! Your personal Easter photo is embedded in this special Easter video card. Simply give us your email address and we will send you a link to your video card which may be shared with family and friends. 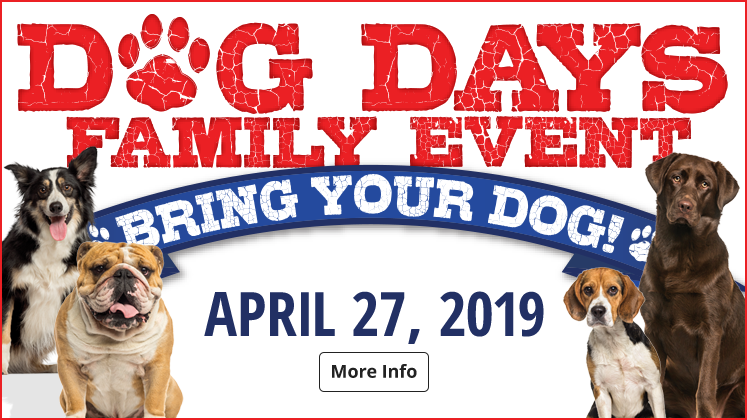 Come celebrate all of our canine friends, companions, and helpers! Join us for FREE photo downloads, seminars, and the first 100 participants to join us will get a FREE gift! Join us for our Mother's Day Photo Event! Saturday, May 11 from noon until 5p and Sunday, May 12 from noon to 4p. You will receive a FREE 4x6 photo and have the opportunity to purchase a photo package that we will print in store for you! Be one of the first 75 mom's to get your photo taken and a FREE plaid tote! One (1) per family please. For the best in hunting and fishing gear, shop Bass Pro, your Las Vegas sporting goods store. 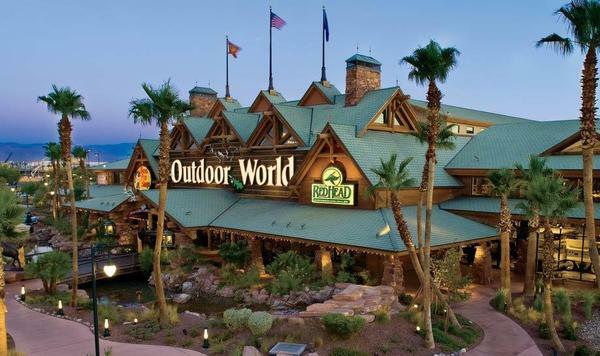 Bass Pro Shops is a leader among fishing shops in Las Vegas, from our 40,000 gallon freshwater aquarium and authentic trout stream to our wide selection of fishing equipment and firearms. 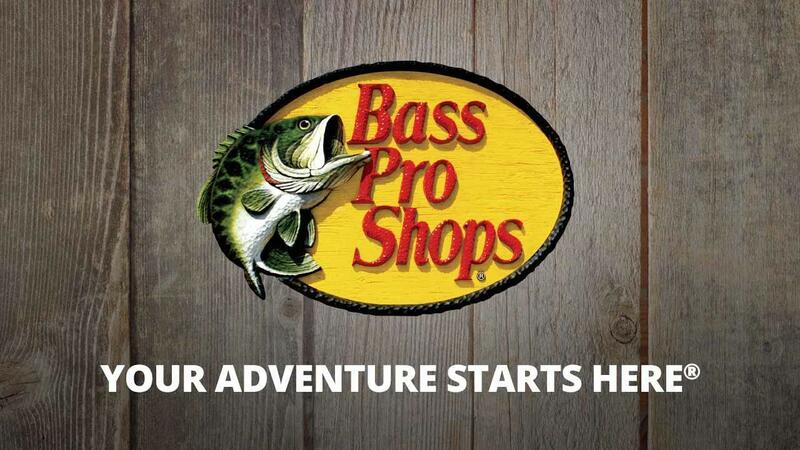 Whether you need gear for fly fishing in Las Vegas, or simply want to maximize your outdoor fun, shop Bass Pro Shops. While in Las Vegas visit the luring attraction of Bass Pro Shops. A short distance south of the Las Vegas Strip, Bass Pro Shops offers a shopping experience you won't soon forget. The 165,000 square-foot, 2-story building is a sportsman's paradise. Massive log and rock work frame the Grand Entrance, reminiscent of the 1800's style Adirondack hunting lodges. Rustic wooden flooring with a vaulted post and beam construction ceiling make up the inside. Relax in the foyer and melt your worries away as you sit in front of the rock fireplace. Or, kick back on our benches while enjoying the shade on the front porch. A 40,000 gallon freshwater aquarium fed by a canyon waterfall, features fish native to the area. These are the fish that fishermen dream of catching or you may have heard about in some of their fishing tales. Large dioramas of various wildlife mounts are depicted in true-to-nature scenes with many of the exhibits coming from museums and private donations. Other unique features include an indoor archery range, and a live duck habitat. Animal prints like mule deer, bighorn sheep, beaver, and ring-necked pheasant are imprinted in the concrete floor. A trout stream meanders through the store populated by brook, brown and the colorful rainbow trout--Nevada's most abundant game and fish species. There is something for everyone here at Bass Pro Shops. We offer a large inventory of outdoor gear with some of the area's largest hunting and freshwater and saltwater fishing selections and a fly fishing shop. Other departments include Camping, Marine, Clothing, Gifts, and Footwear. Visit our website frequently for events, seminars, and opportunities to meet the pro-staffers and celebrities. Maggie and Ken are the Founders/Owners of Homeland Personal Protection. * Ken is an NRA Instructor, Active Combat Focus Shooting Instructor, Defensive Firearms Coach and teaches the Multi-State CCW/CFP. *Maggie is a Hunter Safety Instructor through NDOW, is an NRA Training Counselor. * Maggie and Ken's numerous certifications have shaped their wealth of knowledge, which they share with students. -Nitro Pro Staff member for over five (5) years and has over 25 years of recreational & tournament experience. 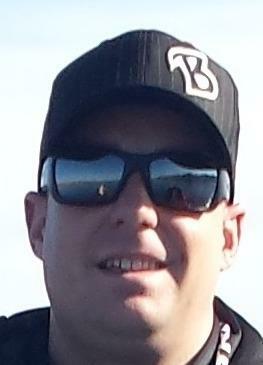 -Nitro Pro Staff member for 2 years and has been a Nitro owner for over 10 years. Also a member of the Lowrance Pro Team. -2 Time Nevada B.A.S.S Nation State Team qualifier. Competitively fishes the FLW Costa Series, WON Bass U.S. and California Opens, Ultimate Bass Team Tour, Wild West Bass Trail and the Nevada B.A.S.S Team Trail. -A Native of Colorado who loves the outdoors and has been hunting and fishing most of his life. Likes to fish the Colorado River and Southern California fisheries.